Great photography can be made in the public eye by those eager for recognition in their own time, but it can also be made quietly in the margins, away from the spotlight, perhaps to be lost in obscurity, perhaps to be discovered later. I first learned of Fred Herzog's work right here at TOP from Mike's June 30, 2008 article "Great Photo Books You Can Buy New—Part III" The subject book was Vancouver Photographs, a book published for a 2007 Vancouver Art Gallery show and one that's become among my most treasured and most viewed books. Now, somewhat unexpectedly, we have Modern Color, a much broader and richer retrospective of Fred Herzog's work published by Hatje Cantz. It's simply glorious. But I’m getting ahead of myself. Fred Herzog was born in Germany in 1930 but emigrated to Canada as a young man, finding a job as a medical photographer in a Vancouver at the University of British Columbia. (Thirty years later he retired as head of the University's Biomedical Communications Department in 1990.) Like so many others, Herzog pursued street style photography around Vancouver as an amateur pastime after work and on the weekends in the late 1950s. Apparently he liked it because he kept shooting for the next 40+ years. Longtime Vancouver residents might primarily view Herzog’s work as a valuable historical record, as Jeff Wall did, as it captures a slightly scruffy mid-century city that no longer exists. The rest of us see some remarkable mid-century street-style photography, made all the more remarkable by its early use of color. Herzog did shoot B&W film and some of these images are in the book. But he is more notable for being an early and faithful adopter of Kodachrome slide film on which the majority of the book's images were recorded. While some professional photographers were taking bows for their early color work, Herzog was quietly, anonymously cranking out an average of two weekly rolls of work that rivaled that of most of the contemporary pros. 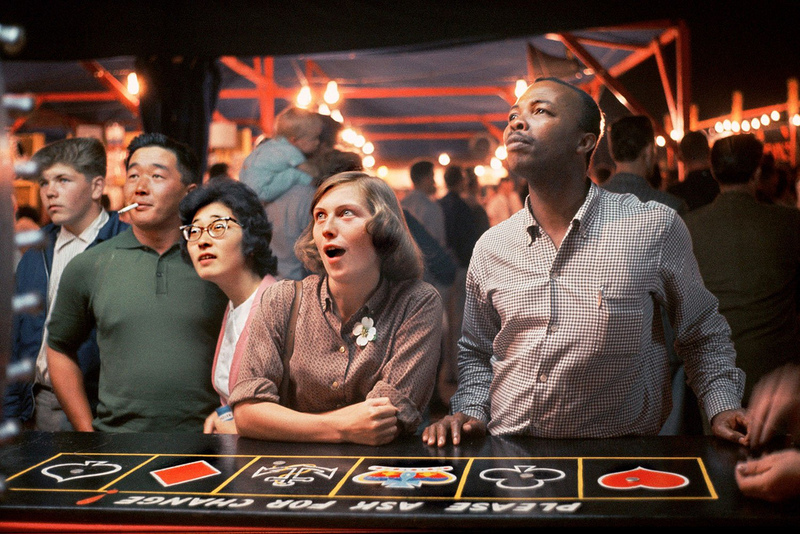 You can see many of Fred Herzog’s images at his gallery's site. They’re quiet, unforced, uncontrived, often atmospherically emotive, but always carefully descriptive and insightful. In the absence of formal training Fred Herzog clearly had a keen and extremely consistent eye for photographic composition and timing. I have come to greatly admire Fred Herzog’s work for several main reasons. He seemed to instinctively know how to use the early-era Kodachrome color palette to tremendous advantage for his scenes. He "sees" visual and emotional meaning and depth potential in many scenes. He knows how and when to compress space. He mastered natural light use in an age of ASA 10 and 25. His work represents a standard against which I measure my own slightly congruent efforts. But in the final analysis I suppose I most admire Fred Herzog’s work because it was done "in the margins" without boastful pretension. It was done for the love and enjoyment of the work, not entirely unlike Vivian Maier’s work. Fortunately, unlike Maier, Fred has received well-deserved recognition within his lifetime and has directed its curation for this wonderful book. • You might find it at bookstores or museums local to you. Henning Wulff: "I've known Fred Herzog since the '70s. Every once in a while he would invite a group of his friends over and he would show us a couple of trays of Kodachromes he had shot. When scanning and digital printing became viable he was finally 'discovered' and he achieved the acclaim he so richly deserved. Tom, Fred, and Tuulikki. Photo by Henning Wulff. "I still go on walks with him around his favourite Vancouver neighbourhoods, and here, during one walk (he's in the centre) we've just met our mutual friends Tom and Tuulikki Abrahamsson. Tom passed away just recently, but I talked with Fred just a week ago. Fred's work was truly groundbreaking. Colour street photography in the '50s was not easy. He shot Kodachrome, starting with ASA 10 and later higher, with ƒ/3.5 and ƒ/2 lenses in grey, rainy wintertime in Vancouver when the exposure times were often in the 1/2 to 1/8 sec. range. He saw the city with fresh eyes and a determination to persevere with his vision, and his remarkable pictures show he succeeded." Gordon Brown: "My thanks to Kenneth Tanaka and TOP for the review. I looked at the 27 screens of Herzog photos posted by his gallery. Some of his photos reminded me of Walker Evans's photos." Ken Tanaka replies: You're not alone. One of the book's essays draws strong visual parallels with Evans's work. Paul De Zan: "Fred's Vancouver Photographs book is probably the first thing I bought as a result of discovering TOP (and certainly not the last). Simply a killer collection of truly evocative pictures; I've given several copies away. I keep my current copy where visitors can find and explore it...and they do." Am I the only one to think "Edward Hopper" while looking at these pictures? Thanks for this review. I ordered a copy this weekend (from the UK, as the Canadian sources seemed already to be sold out). As a lifelong Vancouverite, the first Fred Herzog (and the Vancouver Art Gallery show) were, as Ken Tanaka suggests, revelations partly because it showed us our city as it quickly transitioned into something else. There is still a ongoing and fraught controversy in Vancouver about how quickly our architectural heritage is being replaced and how our streetscapes are irrevocably changing. Herzog's work shows us what we looked like and what our city looked like in a way that few others have done. For us on the edge of the continent, there is also the revelation of powerful, timely art, accessible to us, that is about our place. The Vancouver I grew up in (in the 1970's) was never something we saw reflected in the most powerful art of the day because that art always seemed to come from somewhere else; at least the art that was in mainstream and continent-wide media was always from and about somewhere else. Even today, most of the movie and TV production that is created here is not set here. I know that we are not alone with this and that many parts of North America have this problem. I think that this fact, and the powerful example of Herzog's work, reminds us all to seek out and support the local artists of all types who are honestly and fearlessly, trying to show us what we look like. Just checked the link you provided to Amazon Germany. It is the hardcover edition ("Gebundene Ausgabe") they offer. They made a documentary about Fred. You can find it in the link below. I can't stop looking at this picture, found at ASX. We were in Vancouver last month and visited the Equinox Gallery, which represents Herzog's work. And we saw an exhibition of some of the works at a wonderful new gallery, Audain Art Museum, in Whistler, B.C. It features 20 works that had not been shown before. It was just terrific, highly recommended if you're out that way. I see Hopper in the work too. Thanks for the heads up. This is so much my genre and the price is very reasonable. Ordered (via TOP of course). Look forward to a good browse. What I love in Fred Herzog's photography is the fact that it proves street photography doesn't have to be in black and white. You look at his pictures and they have everything that defines street photography: the small everyday stories, the signs of urban life, the aesthetics, the composition - plus they have the colours. And it works. Street photography has become too much of a cliché. It's all about aesthetics, with exaggerated contrasts and the ubiquitous black and white, and it all happens in urban scenarios in which the presence of a person is a mere justification for applying the 'street photography' label. Yes, there still are wonderful black and white street photographs, but life is in colour. It was William Albert Allard who said " I see in color." I have reasons to assume he wasn't just stating he wasn't colourblind. Fred Herzog, along with Saul Leiter and Joel Meyerowitz, showed me there can be a different approach to street photography. It was nothing short of a revelation to me. That's why I could never take his pictures out of my mind ever since I saw them - a few of them, of course - for the first time, in a Leica-themed exhibition I visited some time ago. On a different note, an intriguing fact that strikes me everytime I see pictures by American street photographers is that American cars have one huge advantage over European and Japanese ones: they look much better on street photographs! When I'm home in time, I read to my three-year-old daughter before bed. They are lovely shared moments, albeit moments usually consisting of repeat stories of princesses etc. This evening she spotted me looking through Modern Color and requested we look through that instead. Joy! She really took the photos in and had comments/questions/explanations of her own on every page. Maybe this is the start of something? His work is wonderful. I saw some of his work when it was exhibited at the Vancouver Art Gallery a few years ago. Brilliant thanks Ken and Mike. I just got one from the UK for $44 Australian. Cheaper than here! Love early colorists. Looks gorgeous just from the thumbnails here. Have ordered a copy through your Amazon link. Gear note: in Henning Wulff's photograph, Fred Herzog appears to be holding an Olympus OM-D, likely an EM1, by the shape of the handgrip. Yes, Fred does use an Olympus OM-D at times now. Also some Panasonic fixed lens cameras. Once agian, you've hooked me - and now I'm shocked at how much the Pound has fallen. Thank you for the link, the UK site was cheaper! I am looking forward to comparing Fred Herzog's work with that of Saul Leiter. Quite a few sellers saying they have a paperback book but there is no mention of a paperback version of the book on the publishers site. The ISBN that Book Depository (and others) and other paperback sellars use is the same as the only one on the publishers site for the hardback (ISBN 10: 377574181X ISBN 13: 9783775741811) which is very odd. An ISBN refers to a specific edition of a book so paperback and hardback versions of the same book use separate ISBNs (so you can tell them apart when ordering and at checkout). I think there is a data entry error on some of the databases these book sellers all use (someone checked the wrong box when uploading the data?). Has anyone seen a paperback version? If so, what ISBN does it use? I've sent an email to hatjecantz.de for clarification: asking them if there really is a paperback version or not. I'll report their comments when I get a reply from them. I'm not usually a fan of street photography, but many of these are beautiful, and more importantly, feel sympathetic to their subject/s. What you say about getting the most from the early Kodachrome palette illuminates my grapplings with the JPEG colour of digital cameras- which quite often seem get certain tints 'wrong'. This matters to me, as I want JPEGs to serve as a record of what the light was actually like when a picture was taken. Thinking in terms of making the most out of a particular camera's palette might enable me to relax a bit about its JPEGs' foibles :). For me, those images of Vancouver evoke a sort of indirect nostalgia -for memories of boyhood fascination with images of American cars in the pages of the National Geographic, or because my brother, who went to Vancouver in the early 70's, might have been lurking, just out of shot, in some of the later images.